A new exhibition on Silverman 3 showcases the extensive history of the UB Bulls. 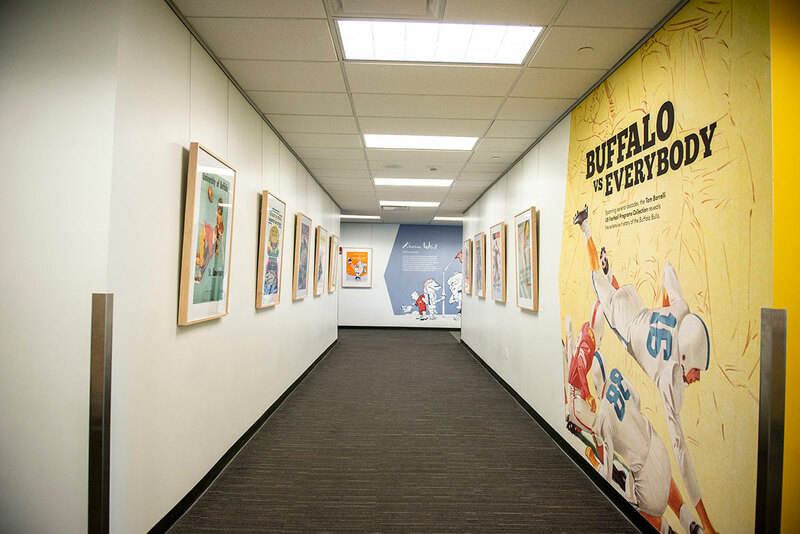 Utilizing imagery from the Tom Borrelli UB Football Programs Collection, Buffalo vs. Everybody highlights the explosive growth of graphic design in the post-World War II era, from iconic covers of stoic athleticism to the zeitgeist in creative advertising. 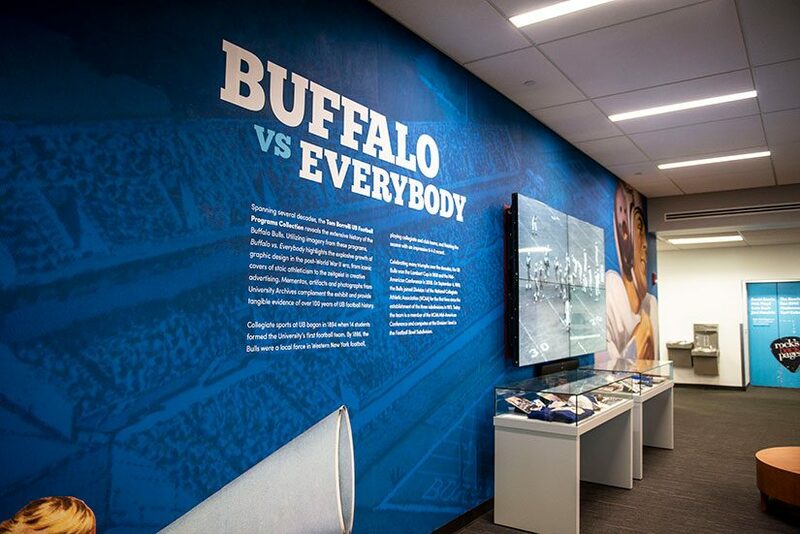 Bulls football game films are on view, along with mementos, artifacts and photographs from University Archives complement the exhibition and provide tangible evidence of over 100 years of UB football history. Of particular note is the work of Kevin Weil. A native of Niagara Falls, sales executive Weil was also a gifted artist, illustrating several football program covers for the UB Bulls 1961 season. His reach extended beyond our university. From 1961-1964, his distinctive illustrations graced program covers for the American Football League (AFL) charter member Buffalo Bills. As a mark of his talents, in 2009 his playful cartoons were featured at the Football Hall of Fame in celebration of the 50th anniversary of the AFL. 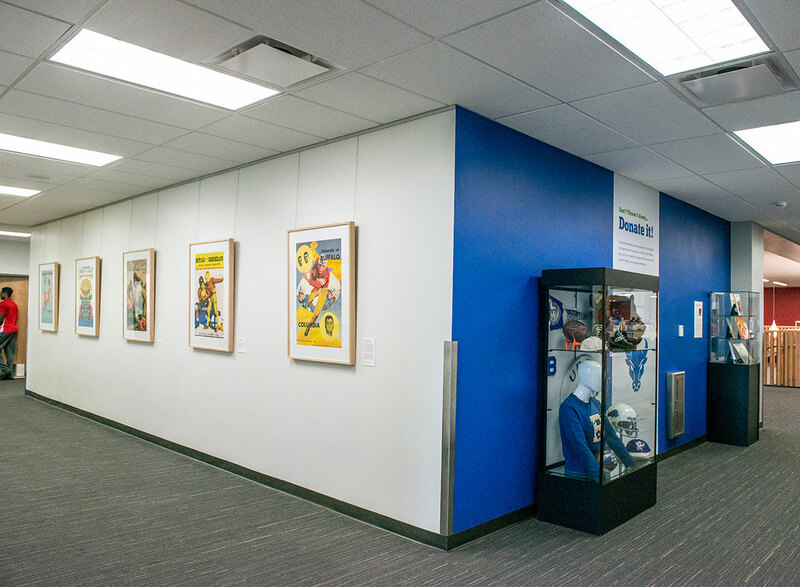 The football programs featured in this exhibit were compiled by Tom Borrelli, a prominent Western New York sports journalist and enthusiastic collector of Buffalo sports memorabilia. While covering a high school football game at Robert Rich All-High Stadium on November 8, 2008, Tom Borrelli was severely injured, passing away two weeks later at the age of 51. Following his death, Buffalo News colleagues created a scholarship in his honor in 2009. Each year the scholarship is awarded to the top high school lacrosse player in Western New York. The Tom Borrelli Football Program Collection was gifted to University Archives on November 2, 2017 by Borrelli’s friend and fellow Buffalo News reporter, Keith McShea. Stop by Silverman 3 and catch a game!